Over the course of the past couple of years, I’ve enjoyed learning how to make homemade products–like homemade liquid dish soap, homemade deodorant and various homemade food products, like bread crumbs and cream of chicken soup. 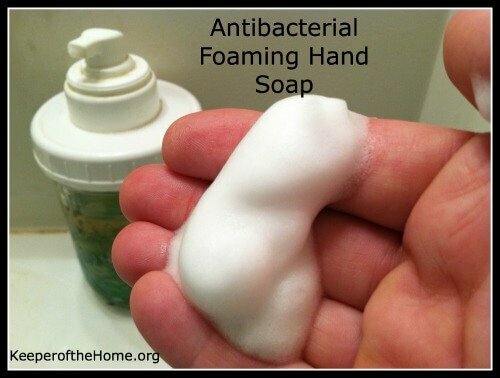 Today I’m giving you a recipe for a safe antibacterial foaming hand soap. Besides being void of the harmful triclosan found in conventional, store-bought antibacterial soaps, this soap recipe is easy, frugal and 100% natural! The antibacterial ingredient in this soap is thieves essential oil. 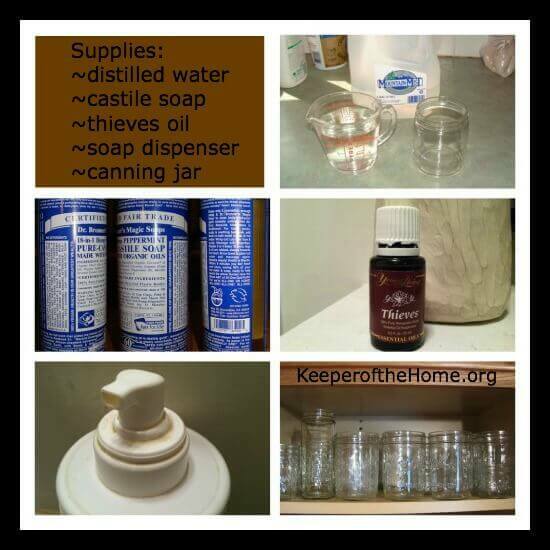 Thieves oil is a natural antibiotic and disinfectant (source). Legend has it that hundreds of years ago, robbers (or thieves) used the oil blend of cinnamon, eucalyptus, lemon, rosemary and clove to rub over their bodies to protect against the plague in Europe. The only brand I have ever used is Young Living Essential Oils, which is supposed to be very high quality. But the first time my family used it, we actually tried making our own. We first used it by making our own thieves disinfecting room spray when we suffered from nearly 4 weeks of the norovirus last spring. Without further ado, here’s a super easy tutorial for homemade antibacterial foaming hand soap! Pour soap mixture into bottle/jar with foaming soap pump. Add 5 drops essential oil to soap, mixing gently. Enjoy your antibacterial foaming hand soap! Where to buy foaming pumps? I found a few: this one goes on top of pint-sized mason jars, this one has a glass/metal container and looks slightly classier, and this is the cheapest one I saw. You can really reuse any foaming soap dispenser for this tutorial, but my family has enjoyed using this tutorial to make attractive soap bottles out of old canning jars. We made a peppermint version of this soap to give as Christmas gifts last year! This tutorial can really be changed and used with any variety of essential oils to alter the scent. The thieves oil, though, makes it a great soap to use during the fall and winter months when illness runs rampant–but you don’t want to break out harmful antibacterial soaps! Want more information about how to use essential oils for your home and health? My friend Mary at The Encouraging Home has a free eBook guide to essential oils on her site. 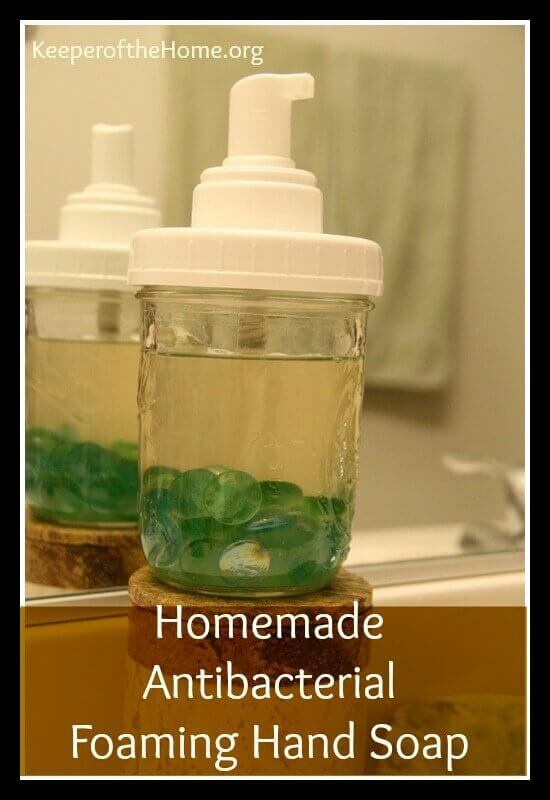 Have you ever used essential oils to make homemade soaps or other personal care products? Let’s Talk About Birth Control, Shall We? Hi there! How do you get your soap so clear? I love making my own soap but it’s always cloudy. Thieves is the best!